Pune 21 Nov 2017 (PCP NEWS) : After seventeen years Indian Navy to get INS Kalvari, “A Deep Sea Tiger Shark”, a Diesel Electric Conventional Submarine, which will be commissioned in the 2nd week of December, by the hands of Prime Minister Narendra Modi. INS Kalvari which was to roll out in 2012, it is the first of the six Scorpene class submarines. These are being built in India by Mazagon Docks Limited, which is a Ministry of Defense’s owned shipyard, having collaboration with France’s Naval Group (earlier called the DCNS). This Submarine will have Anti-Ship Missiles and Long-Range Guided Torpedoes and Modern Sensor Suite that will enable it seek out the enemy from long ranges. The Scorpene Project was signed in October 2005 and was to cost the exchequer Rs 23,652 crore. The project has seen delays and cost overruns. While India has one of finest submarine arm, acquisition of these critical platforms suffered a jolt after allegations of corruption in the late eighties. It was alleged that kick-backs were paid when India bought submarines from Germany. Investigations that spanned over decades remained inconclusive and successive governments shied away from acquiring submarines. India is now building a fleet of Nuclear Powered Submarines that are capable of firing Nuclear Missiles from under the sea. The Indian fleet of submarine has been declining steadily. It now has just 13 conventional submarines, in which nine Russian made Kilo-class (EKMs) and four German-designed HDWs (SSKs), most of which are over three decades old. As against India’s dozen-odd conventional submarines, China has fleet of about 60 odd conventional and Nuclear Submarines. Increasingly, these are being spotted in Indian Ocean Region (IOR). According to estimates of the Pentagon the Chinese People’s Liberation Army (Navy) will have about 70- 80 conventional and Nuclear Submarines. In the late 1990s, New Delhi cleared the 30-year submarine building plan. It was envisaged that Indian Navy would buy six submarines each from the Western and Russian Bloc and subsequently come-up with its own submarine design. While the project failed to take-off, the 30-year submarine plan was tweaked subsequently. 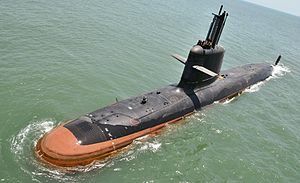 India went for mix and match of Conventional and Nuclear or Strategic Submarines, which were included at a later stage.